Category Archives: lightning brewing co.
Poway’s Lightning Brewery often gets overlooked in the crowded beer market that is San Diego today. They don’t brew any over the top hop bomb West Coast IPAs, in fact they don’t brew any (American style) IPAs at all (although Lightning’s Jim Crute says their Black Lightning Porter is really a Black IPA, I’ll have to revisit that one when the fresh batch comes out. Unlike most other breweries in San Diego, Lightning focuses mostly on classic European styles, sometimes with tweaks and changes and sometimes brewed traditionally. Case in point: Thunderweizen Ale their German-style Hefeweizen. I’ll admit I’m not hefeweizen expert (I wouldn’t call myself an expert on any style of beer, but there are plenty of styles I know a lot more about) so I can’t evaluate Lightning’s claim that this is a traditional German style hefeweizen, though I have no reason to doubt it. Thunderweizen is listed at 5.5% ABV with no IBU given, but I would guess not much, this beer is much more about the yeast (‘hefe’ means yeast in German) and wheat than being hoppy. It’s cloudy and unfiltered, as even novice hefeweizen drinkers have come to expect from the style, dark yellow with a fluffy white head. As soon as I stared to pour I could smell it, even with my nose about a foot away from the glass, this is a aromatic beer. Big sweet over-ripe banana smells dominate with just a bit of clove spiciness in the background when you really get your nose in there. The taste however was just the opposite. Spicy clove flavors up front with a noticeable but somewhat subdued banana flavor coming second. The finish is dry, much drier than I expected for a beer like this. And there’s a pleasant bitter, clove like spice aftertaste that hangs around after taking each sip. 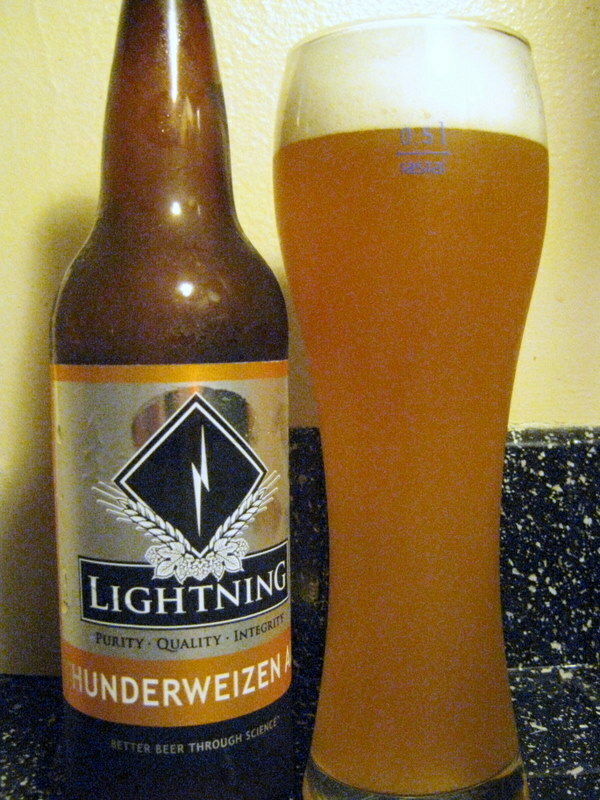 Thunderweizen is available in 22oz bottles ($4-6) and on draft. Posted by Jeff Hammett in beer reviews, breweries, farmhouse friday, lightning brewing co. 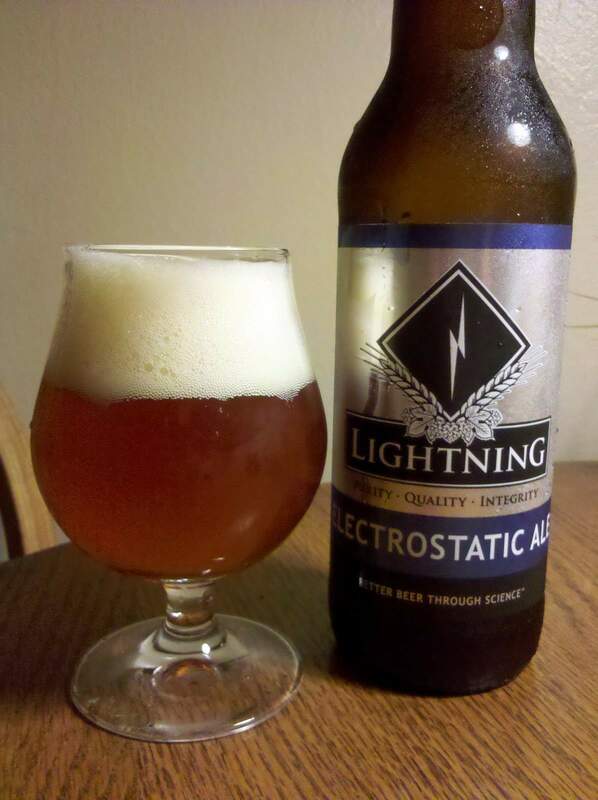 Lightning Brewery’s Electrostatic Ale is a high gravity Biere de Garde, the lesser known of the two styles that make up “farmhouse ales” (the other style being Saison). More on the differences between the two styles in a future blog post. This is our French Farmhouse Ale, whose rich aroma is full of sweet, fruity esters and notes of farmhouse yeast character. This medium-bodied, unfiltered beer has sweet malty foundation with a touch of sourness and hints of spiciness which add an intriguing character to the beer. Like the flavor, our carbonation is naturally produced by our fermentation methods – light, playful, champagne-like bubbles make enjoying this beer an experience not to be missed. As soon as I started pouring this beer I knew I should have poured it more carefully the pillowy white head was building atop a tiny amount of beer. After letting it settle a bit I poured some more which is what you see in the picture. This beer was much darker than many farmhouse ales I’ve had before, a red or dark orange color. As far as I can tell Biere de Garde’s can typically range from a lighter golden color to a darker orange or red, so this isn’t unusual. The smell was very sweet, sugary and candy smelling from the Belgian yeast. The taste however wasn’t anything like the smell let on. There were some bready malts at first and then the alcohol started to come through. It’s apparent this is a high ABV beer, but it’s not overpowering or distracting. Just a reminder that you shouldn’t drink too much of it if you have things to do afterwards. I didn’t pick up many fruity ester or any sourness that they describe but there was some spiciness possibly from both the hops and the yeast. There was some clove like phenolic flavors but they were kept in check enough to not overpower everything else. This is a great beer for these warmer days, but still cooler nights we’ve been having lately. Probably not one you would want to drink on the hottest day of summer though. I haven’t heard of anything special going on. 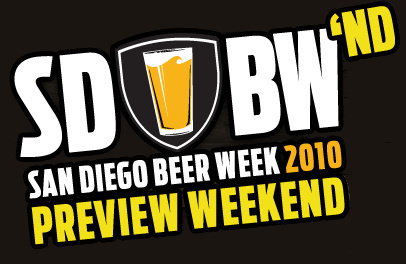 If you know of something please email events@sandiegobeerblog.comto get it added. Mad River Brewing Company makes some seriously good beers. At last year’s Great American Beer Festival they won the Small Brewing Company of the year category and took home a gold, silver and bronze medal. Hamilton’s Tavern will have their Steelhead Double IPA on cask for this week’s Firkin Friday. Chances are good they’ll have a few other Mad River treats as well. Now that it’s spring it’s time for KNB Wine Cellars to start up their BeerBQ’s again. This time it’s with Portland Maine’s Shipyard Brewing Company. They’ll have around 15 beers from Shipyard on draft paired with traditional New England food. Check out more details on Facebook. Stone Smoked Porter with Vanilla Beans seems to be showing on draft at more bars and restaurants recently, but the only way to get some to enjoy at home is to get a growler filled at the brewery in Escondido. They don’t do fills all the time, so if you’re a fan head on up Sunday to get a growler full. Toronado hasn’t announced many details on this one yet, but they’re calling this “Tart Tuesday” and say it’s a night sour lovers won’t want to miss. I expect Toronado will post more details here as the date nears. Small Bar will have some beers from Poway’s Lightning Brewery on tap with a keep the glass special. $5.50 gets your glass and first beer and refills are only $3.50 after that. No word on exactly what they’ll have on draft but Lightning is a nice change of pace from some of the overly hoppy beers around town. Ballast Point is teaming up with MIHO Gastrotruck and Fiji Yogurt for another casual beer dinner. MIHO will be serving Drunken Wild Mexican Shrimp and Grits prepared with Abandon Ship Smoked Lager and Fiji will have a Ballast Point Tongue Buckler wort based yogurt, flavored with Peanut Butter and Honey. Ballast Point will be pouring plenty of beers including Abandon Ship Smoked Lager, Abandon Ship Smoked Lager with Dried Smoked Chipotles, Habanero Sculpin IPA, 2008 Barrel Aged Sea Monster Imperial Stout, 2009 Sea Monster Imperial Stout and this year’s version of Sea Monster Imperial Stout. They’ll have recommendations on which beers pair best with what food. This all happens from 4:30-7pm at Ballast Point/Homebrew Mart in Linda Vista. Another Friday, another Firkin Friday at Hamilton’s Tavern. This week they’ll feature Poway’s Lightning Brewery with a cask of their Old Tempest Ale, their 9.5% ABV UK style strong ale. As usual Hamilton’s should have a couple other Lightning beers on draft as well. Churchill’s Pub and Grille in San Marcos is hosting their second annual Churchill’s Renaissance. Starting at 11am they’ll have all sorts of delicious beers that don’t see the light of day too often. Sure they’ll have Russian River Brewing Company’s much sought after Pliny the Younger, but they’ll also have a ton of other delicious and rare beers including this year’s version of Port Brewing Co.’s Churchill’s Finest Hour, an imperial stout aged in Jack Daniels whiskey barrels. Get there early for the extra rare stuff. Sierra Nevada Beer BrunchBQ Finale is happening at KNB Wine Cellars from 11am-3pm to finish off their Sierra Nevada week. They should still have plenty of great Sierra Nevada beers and some delicious food on the BBQ. Ritual Tavern will be having a Fat Tuesday celebration. They’ll have The Bruery’s Saison de Lente and Lost Abbey’s Carnevale on draft. For food they’ll have fried oyster Po-boys, gumbo and beignets. Ballast Point and Green Flash are teaming up to take over all the taps at Rancho Bernardo’s URGE Gastropub. They’ll split URGE’s 51 taps fairly evenly and if you get there early you might even score a commemorative pint glasses to take home. No word on what each brewery will be brining but expect some great beers to be pouring. Down at Small Bar they’ll be featuring AleSmith with some keep the glass specials and pint glasses to take home. Sure, it’s only Tuesday, but that doesn’t mean it’s too soon to start thinking about the upcoming weekend. Especially when that weekend just so happens to be the preview weekend for the 2010 San Diego Beer Week (sometimes cleverly referred to as San Diego Beer Week’nd). The first ever San Diego Beer Week took place last November, and the second year of the event will be taking place this year from November 5-14, but there’s just so much great beer around that they have decided to hold a special preview weekend. San Diego Beer Week Preview Weekend events starts Thursday evening with a beginner brewing class at Home Brew Mart taught by Ballast Point Brewing Co. brewer Doug Duffield. Homebrewing is a great way to learn about beer and is fun and delicious. This class will go over the basics of brewing and will brew a 5 gallon batch. The class is limited to 30 people and costs $10. Call (619) 295-2337 to reserve a spot. And if a beginner brewing class would be too basic for you, stop by Home Brew Mart on Friday for a 10% discount on all products. If you would rather drink beer than learn how to make it Thursday night both Ritual Tavern and Hamilton’s Tavern have you covered. Ritual Tavern will host a very special blend of Alesmith Brewing Co.’s Speedway Stout. Starting at 8pm they’ll have a 3 year blend of Speedway, 2008 and 2009 were barrel aged and blended with fresh 2010 Speedway Stout and Ritual Tavern will be pairing this with homemade Speedway Stout ice cream. This will be a unique beer, one you probably won’t ever get to taste again. Speedway Stout is in my top 10 all time favorite beers. I’m excited to try this. Over at Hamilton’s Tavern they’re doing their Firkin Friday a night early on Thursday hosting Lightning Brewing Co. They’ll have Fairweather Pale Ale on cask and Elemental and Black Lightning Porter on draught. Friday is Allagash Night at Downtown Johnny Brown’s (in case you missed the Allagash flights at Blind Lady Ale House this past weekend, or just want more). They’ll have Curieux, Victor, Victoria, Confluence, Wit, Interlude, Odyssey, Fluxus 09′, Four and Dubbel as well as BBQ brisket in a Curieux sauce. Also Friday night is Beer Hall at The Lodge at Torrey Pines. Seven chefs will join seven brewers to pair beer and food. It’s $60 per person and 10% of the proceeds will go to the San Diego Brewer’s Guild. Click here for the menu and beer pairings. Saturday Ballast Point Brewing Co. will be hosting a tasting of their three beers that won the World Beer Cup Champion Small Brewery. That’s Sculpin IPA, barrel aged Piper Down Scottish Ale and Fathom India Pale Lager. Also on tap will be 3 Sheets Barleywine aged on 3 Sheets rum soaked oak chips. That all happens at Ballast Point Brewing Co. in Linda Vista from 1oam-5pm Saturday. After that head on over to Hamilton’s for 2nd Saturday with Bear Republic. There will be casks of Racer X Imperial IPA and Big Bear Black Stout and 18 Bear Republic beers on draught as well as complimentary BBQ from the kitchen. Sunday wraps up San Diego Beer Week Preview Weekend with the 4th Annual Hamilton’s Padres Day (which as of this writing it appears as if there are still tickets available) for $45 you get field level tickets at Petco Park, a Hamilton’s baseball jersey, transportation from Hamilton’s to Petco and back, two drinks at the pre-game party at Downtown Johnny Brown’s as well as craft beer on the bus. Sunday is also Suds for Surgeries, the first ever Mission Valley Craft Beer Festival at The Handlery Hotel. $30 gets you unlimited beer and food tastings. Participating Breweries on hand will be: Airdale, Ballast Point, Coronado, Firehouse, Green Flash, Karl Strauss, Mission and Stone Brewing Co.
And if all that weren’t good enough, the 2010 FIFA World Cup gets started Friday June 11th. Plenty of bars around San Diego will be showing the games and offering drink and food specials. One game which ought to be pretty good and draw a crowd is USA vs. England on Saturday. If you know of any other beer events this weekend, or have a favorite bar (with a great beer selection) to watch the World Cup leave a comment below.